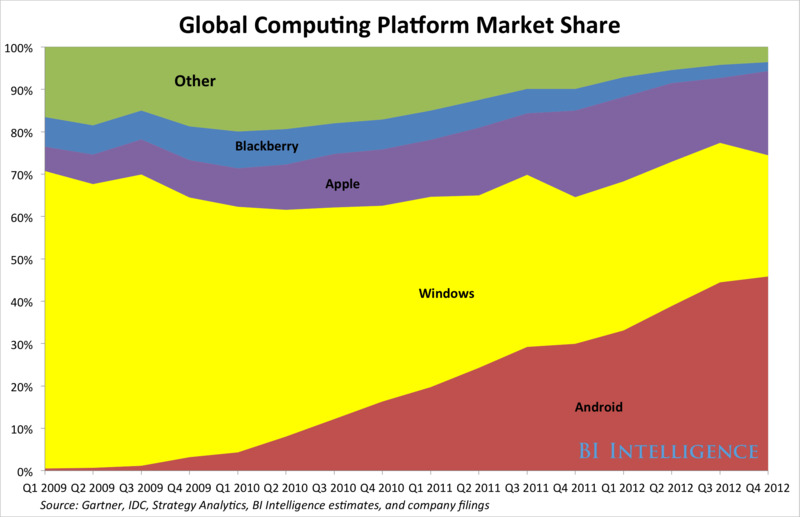 The precipitous growth in smartphone sales has propelled Google’s Android platform to become the world’s largest computing platform across devices. Android’s incredibly fast rise to the top spot— the first Android phone was sold in October 2008— breaks Windows’ decades-long stranglehold on computing systems. Meanwhile, once-dominant Windows was the operating system on 29 per cent of computing devices shipped in the quarter, down from 70 per cent at the start of 2009. According to our data, Android usurped Windows’ throne as the OS shipped on the most devices during the second quarter of 2012. It should be noted that these shares are based on quarterly shipment figures, not installed base. In all likelihood, given its long run at the top, Windows is probably still the largest computing system in the world by installed base. What explains Windows’ fall? While stagnant PC sales haven’t helped, Windows decline is primarily a function of Microsoft’s inability to gain traction in either the smartphone or tablet markets. Shipments of Internet-connected mobile devices more than doubled PC shipments last year. 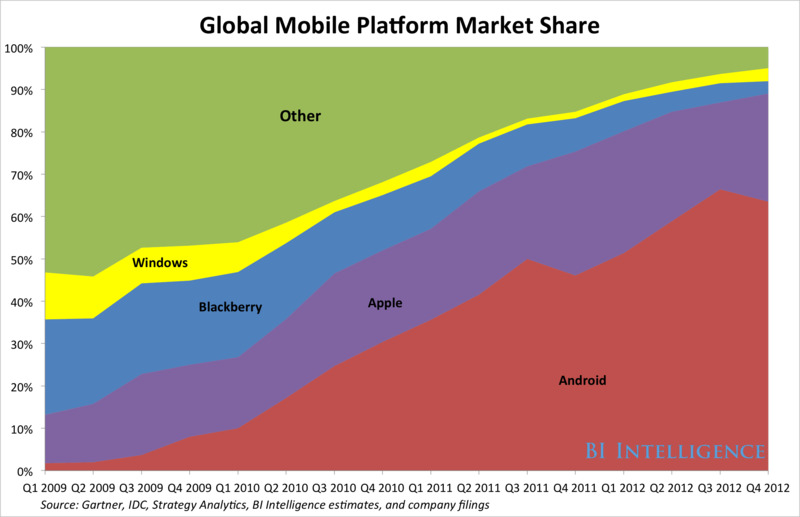 Windows Phone and Windows-powered tablets combined for a scant 3 per cent share of mobile devices shipped in the fourth quarter. That’s actually an improvement over prior quarters, but Microsoft has a long way to go if it is going to arrest Windows flagging market share on the back of mobile devices.